Dogs will be dogs and they will walk through and on anything without regard to something sticking to their paws. Many dogs have a lot of hair in between their pads, so anything they walk in, such as mud or gum, will stick to the hair. This can make it easier to remove than when it is stuck on the skin itself. Most dogs do not like their paws handled because their feet are very sensitive. Determine which part of the paw the gum is stuck to. 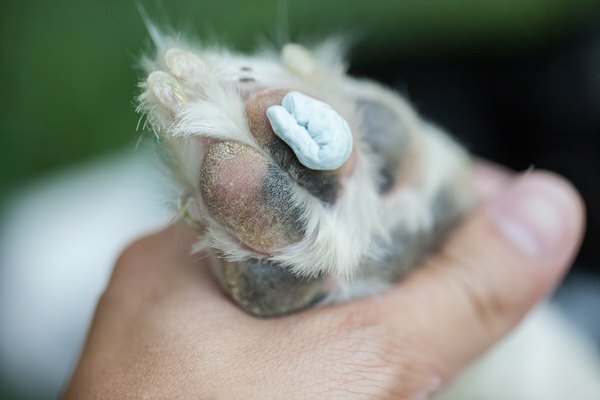 If your dog has a lot of hair on his feet, chances are it is stuck to the hair of his paw. 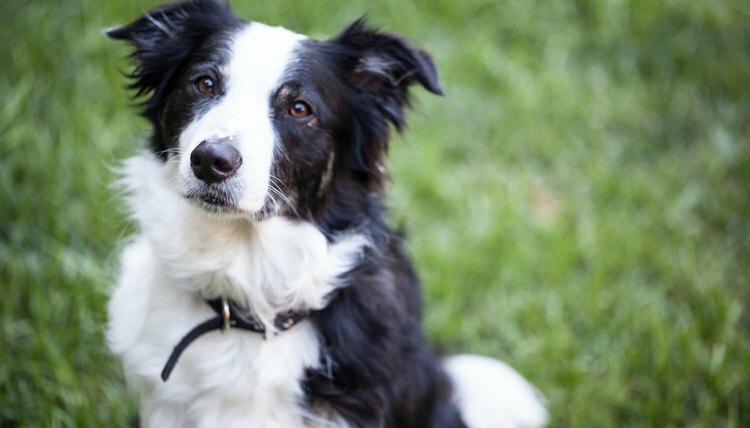 If your dog is short-haired, it could be stuck to the skin of her pad. You will also need to determine how stuck the gum is; if it is just slightly stuck, you may get lucky and be able to pry it off gently with your fingers. Wet a cotton ball thoroughly with water and dishwashing soap. Wet the paw that has the gum, and work the dishwashing soap in with the cotton ball. This will help loosen the gum from the hair and skin so that you can remove it. Rinse your dog's paw off thoroughly so that all the soap is removed. Examine the paw. If the dishwashing detergent and water failed, dry the paw with a towel. Use another cotton ball and dip it in salad oil. Work the oil into the paw that has the gum. The oil will make the gum slippery so that it slides off your dog's foot. Rinse the paw off and dry it with a towel. Your dog will lick off any oil remaining on his foot. 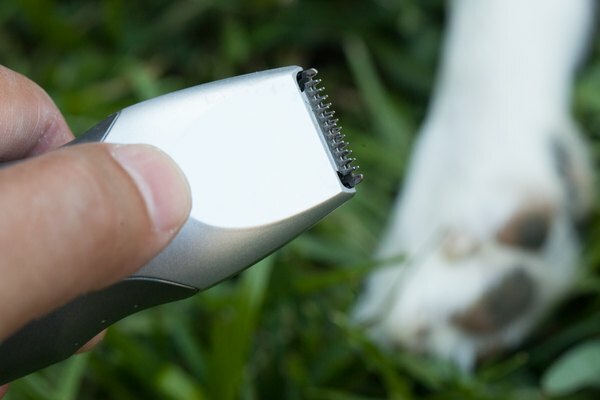 Shave off the hair between the paw pads using a dog clipper if your dog has long hair on her paw and it appears the gum is only stuck to the hair. This is normally the easiest method, but it only works if your dog has long hair on the pad of her foot and the gum is stuck to it. When walking your dog, make sure to stay out of areas with tall grass, since these areas tend to be filled with debris or other items that can stick to your dog's paw. 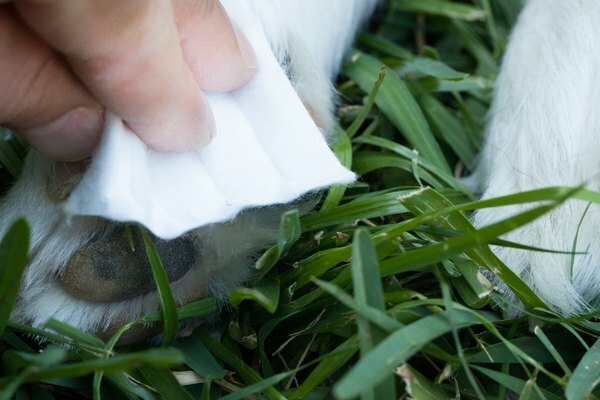 If the gum is stuck to his skin on his paw and salad oil or dish detergent does not help loosen it, you may need to take him to your veterinarian so that she can safely remove it for you.